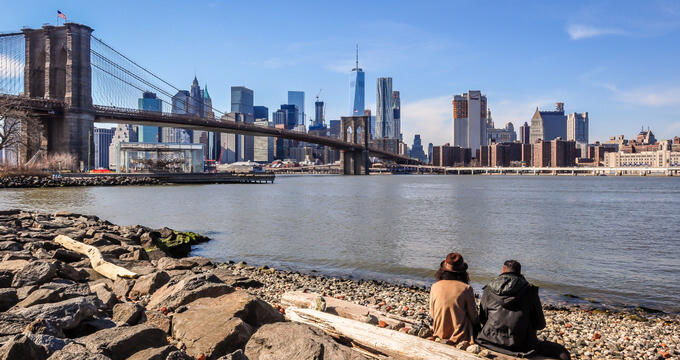 Brooklyn locals and visitors are thoroughly spoiled for choice when it comes to finding a great location for a romantic date night. There is a lot of emphasis on serving sustainably produced and locally sourced products. If you are celebrating a special date night you can spoil your partner by booking a wonderful tasting menu at Delaware and Hudson, Zenkichi or Rosewater. You will be sure to sweeten your date’s heart when you take him or her to The Blue Stove for a delicious feast of home-baked pies and tarts. You can pop in for a cup of tea (or coffee) and a slice of delicious cake or pie at any time of day and the café also serves some great savory dishes for lunch including some wonderful quiches and their signature chicken pot pie. All the fare at The Blue Stove is lovingly hand-made using all the very best ingredients, many of which are locally sourced, and the authentic old-fashioned flavors will take you on a trip down memory lane. 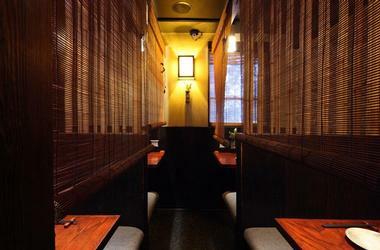 You can look forward to tantalizing your taste buds on your next date night when you book a table at Ramen Yebisu. Chef Ito Benkai is famous for his authentic Japanese ramen bowls which will have you thinking you have just arrived in Japan. At the heart of the flavorsome bowls lies Chef Ito’s delicious Tonkotsu Miso broth which takes at least 12 hours to reach perfection. 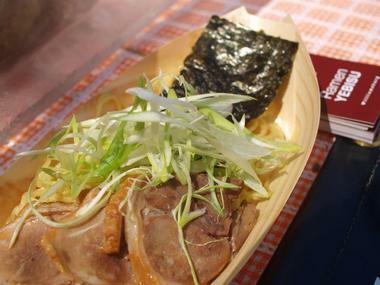 After that the Ramen Bowls are laden with your choice of ingredients including pork, vegetables and noodles. There is also vegetarian, seafood and gluten-free options available and you can enjoy some delicious appetizers to whet your appetite. Named after the historic Railroad, Delaware and Hudson is an intimate 38-seater Michelin-starred restaurant which is ideal for a special date night. 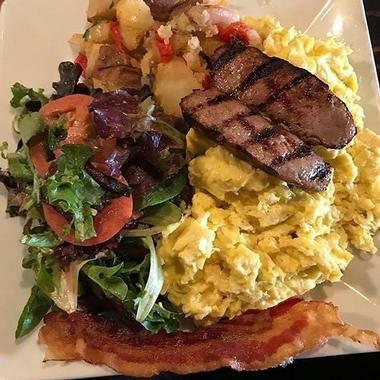 Lunch and brunch are casual affairs where you can choose tasty dishes from the a la carte menu, including perennial breakfast favorites side by side with lunchtime salads, burgers, and much more. At dinner time Chef Patti sets out to impress with an elegant seasonal four-course set menu that is bound to delight all who come to dine. Should you wish to have a lighter meal you can visit the adjacent tavern where you can enjoy local craft beers together with tasty tavern snacks and light meals. If you enjoy Japanese food and you are looking to impress your date, Zenkichi is exactly what you are looking for. This modern Japanese brasserie is ideal for date night, offering semi-private booth tables where you and your date can connect while sampling some of the best Japanese cuisine in New York. Although the restaurant offers an extensive a la carte menu, the best way fully appreciate the fine food is to order the Omakase (Chef’s 8-course tasting menu) which can be served with or without sake pairing. (A vegetarian option is also available and the set menu changes every five weeks). You are bound to make a great impression when you book a table at The River Café for your next special date night. 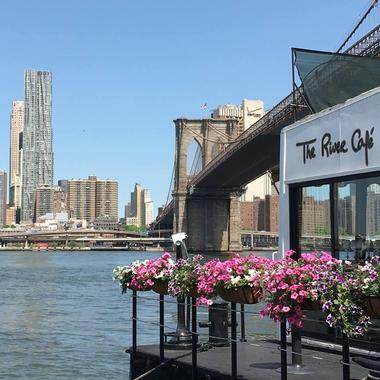 The River Café enjoys one of the most sensational locations in New York, nestled directly on the river under the Brooklyn Bridge. 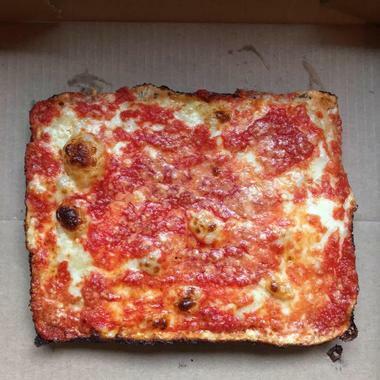 The restaurant has been pleasing Brooklyn palates for over 40 years and you can rest assured that you are in for a taste sensation. You can visit for breakfast, lunch or supper, but there is something particularly magical about the amazing view at night. The menus are all fixed price and include two or three courses and you can also request wine pairing. Family owned and run, Convivium Osteria offers a warm and welcoming rustic Italian ambiance which is perfect for a relaxed date night. The restaurant embraces traditional Italian cuisine using only the best available local produce including organic vegetables, naturally raised meat and home-made pasta produced on site. You can start off with something from their extensive selection of appetizers (antipasti) before moving on to a mouth-watering pasta or gnocchi dish or opting for one of their delicious main courses of fish, lamb, chicken, rib-eye or rabbit. Choose your wine from their extensive wine list which features many Italian varietals and remember to save space for a delicious dessert. 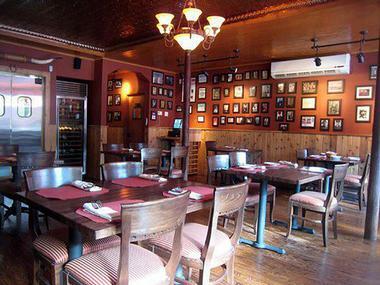 For great date-night atmosphere you need look no further than Delia’s Lounge and Restaurant in Bay Ridge. 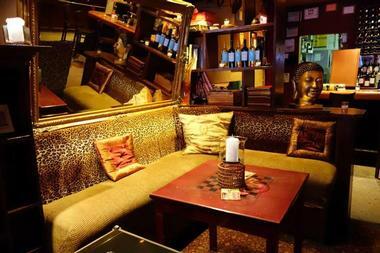 As you enter the candle-lit restaurant/lounge you will immediately feel at home – you can settle into a comfortable couch or table booth and enjoy a great cocktail while you decide what you would like to eat. The light menu is eclectic to say the least, including cheese platters, pizza, tacos, wings, dumplings and skewers, most of which feature a delicious spicy sauce. If you and your date enjoy cooking your can gather together a group of ten and book a private dumpling cooking class with Chef Craig. 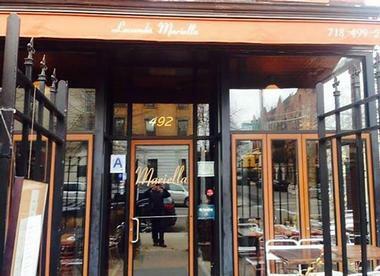 When only the finest locally sourced organic ingredients will do for your special date meal you need look no further than Laconda Mariella. This respected Italian restaurant’s bare-brick walls and subtle décor create an intimate atmosphere and you can watch the chefs at work in the open-style kitchen. The dinner menu includes several salads and vegetarian choices as well as fish, meat and poultry for the carnivores. Remember to leave some room for one of their delicious desserts – the Torte Della Nonna is particularly popular with reviewers. The restaurant also serves a Saturday and Sunday Brunch which features all the Italian favorites alongside a selection of benedicts and other breakfast dishes. Rustic brick walls, lots of wood and colorful Uruguayan fabrics perfectly set the scene for a romantic date night at Tabaré Uruguayan restaurant. 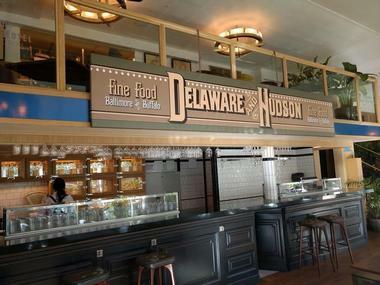 Your taste-buds are in for an exciting experience as you navigate the tasty lunch or dinner menu. Expect hearty flavors, plenty of spice and enticing desserts. A great meal warrants a good drink and the restaurant has an extensive cocktail menu and wine list. 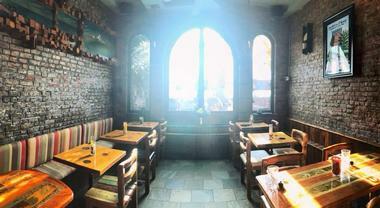 Tabaré is open for lunch and dinner during the week and serves a great brunch on Sundays. Consider dining (anytime) on a Wednesday night or between 5-7pm Monday to Friday (Happy Hour) when most of the drinks are half-price. 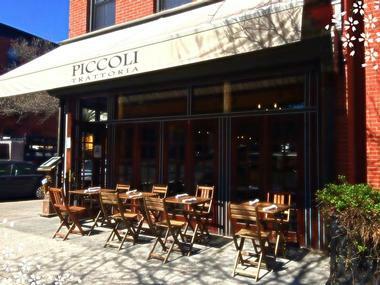 Located in a quiet part of Park Slope, Piccoli Trattoria has a very welcoming and laid-back atmosphere – the perfect choice for a relaxed date night. If you are fussy about the origins of your food you will be pleased to hear that the fantastic home-made pastas are all made using organic New York Grains and that all their other ingredients are either organic locally sourced or imported from Italy. You can look forward to selecting delicious innovative salads, pastas, risottos, entrees and desserts, washed down by your choice of wine by the glass or bottle. There is a quiet outside seating area which is great in summer and you can also try their very popular Saturday and Sunday Brunch. Tucked away in a quiet corner of Park Slopes, Bella Gioia will impress your date with its relaxed casual ambiance and some of the best Sicilian food in the city. The restaurant’s slogan is “Food from the Heart” and they go about tantalizing your taste buds by using only the best and freshest ingredients prepared in the Sicilian tradition. Their specialties include their cured meat and cheese boards, (all ingredients imported from Italy) as well as their wonderful pastas. There are lots of great salads and several vegetarian options. The restaurant believes that good food should be paired with equally good wine, and invites you to sample some of their Sicilian imports. 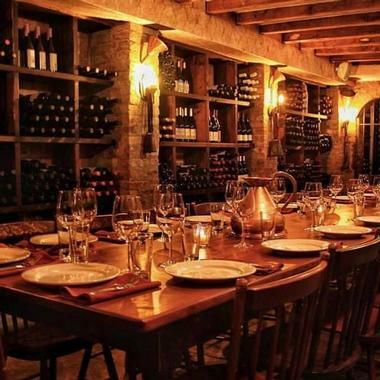 Exposed brickwork, rustic wooden furniture and a wall of wine perfectly set the scene for a romantic date at Scottadito Tuscan restaurant in Park Slopes. Showing a true commitment to the environment, Scottadito Osteria features furniture made from recycled and reclaimed wood and only serves food using sustainably produced ingredients. You can choose from an extensive dinner menu of Italian favorites like Caprese salad, beautiful home-made pastas, and robust mains and sides. If you fancy impressing your date at home you can order most of the dishes delivered to your door. 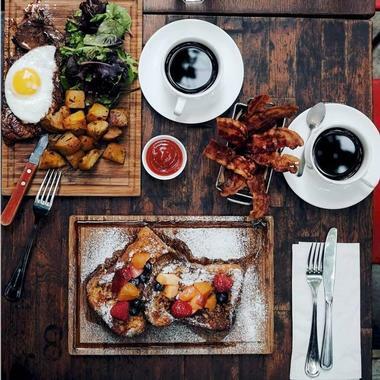 Scottadito also serves a delicious Saturday and Sunday Brunch from 11am to 3.30pm. 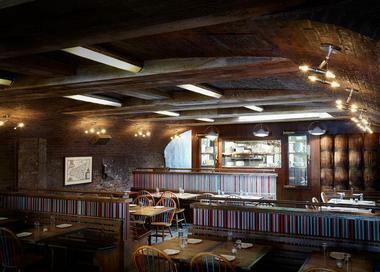 La Nonna Restaurant and Bar in Williamsburg is an elegant and inviting venue where you and your partner can spend date night enjoying a refined Italian menu created by Chef Cono Morena, who hails from Campania in Italy. 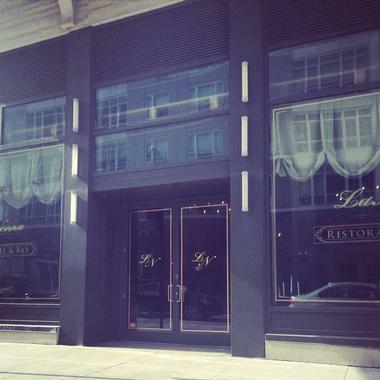 The menu features the Chef’s modern take on the traditional Italian cuisine his grandmother (Nonna) used to cook. Whole-wheat and gluten-free pasta options are available and there is an impressive selection of seafood dishes like grilled octopus, pan-seared shrimp, seared scallops and a fantastic lobster, shrimp and crab ravioli. Carnivores have not been neglected – juicy grass fed beef steaks, lamb chops and veal are popular choices. Friendly staff, a welcoming ambiance and consistently good food are three good reasons for choosing De Stefano’s Steakhouse for your next date night. The restaurant serves prime dry-aged steaks served on or off the bone, including perennial favorites like Fillet Mignon and New York Strip. Although the menu is definitely meat-heavy, there are a few choices for non-meat eaters including some vegetarian starters, fish mains and several vegetable side dishes. You can accompany your meal with a good wine from their expansive wine list (which includes some half-bottles) and round off the evening with a creamy Irish coffee or liquor. Park Slope’s Rosewater Restaurant is the brainchild of former Savoy Hotel chef John Tucker who invites discerning diners to come and enjoy modern, seasonal American food prepared from (mostly) locally sourced and sustainable produced ingredients. The menu changes on an almost daily basis to make the best possible use of fresh seasonal produce and you have the choice of ordering a starter, main and desert from the a la carte selection or ordering the Summer Market menu which offers three courses and optional wine pairing at a fixed price. For a really special date you could treat yourselves to the five-course, fixed price Rosewater Tasting Menu. 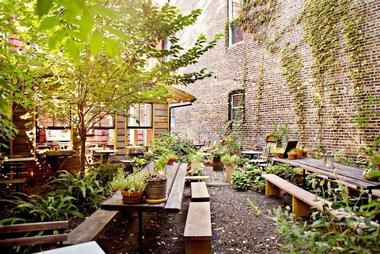 A Brooklyn brownstone sets the scene for a Latin American-style date night at the Palo Santo Restaurant. The restaurant uses only the freshest grass-fed beef, free-range chicken, heritage-breed pork and sustainably-caught fish and seafood, accompanied by farm-fresh local produce. You can expect some tantalizing taste sensations from Chef Jacques Gautier’s simple and rustic menu which fuses popular Latin and Caribbean flavors. The menu changes daily but you will always find a selection of tortillas, tacos, salads and hearty main courses. You can choose individual dishes from an a la carte selection or go for the 3-course fixed price dinner accompanied by your choice from over five dozen South American and New York State wines. Milk and Roses offers the perfect ambiance for a romantic night out – think plush leather couches and candles indoors and a delightful lantern-lit garden for steamy summer nights or lunches. The delicious American dishes have a distinct Southern-Italian influence and include Panini, salads, pizzas, and pastas as well as main courses featuring meat and fish. They also do a brunch menu on Saturday and Sunday and offer a wide variety of spirits, classic cocktails, Italian wines and local craft beers. One thing to remember to avoid embarrassment – the restaurant only accepts cash so a quick visit to the ATM is advised. Carnivores looking for a great meat restaurant with a comfortably rustic atmosphere need look no further than El Almacen for their next date night. Argentineans certainly know how to cook a steak to perfection and that is exactly what you can look forward to enjoying at El Almacen. You can whet your appetite with a few delicious starters like Ceviche or grilled octopus before moving on to the house specialties from the grill, which include chicken, ribs and, of course, juicy steaks cooked to perfection. 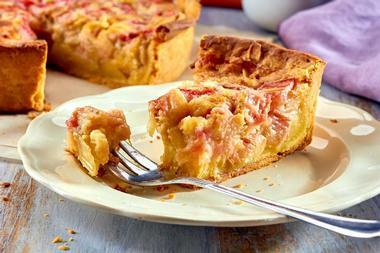 There are a couple of dishes suitable for vegetarians but the emphasis is squarely on meat. Choose from a selection of wines, beers and cocktails to enjoy alongside your steak.